This page is all about me, isn’t it? Me. Me. Me. But I would like to start with the two people who had influenced me the most, my parents, because they’d helped me to define who I am. I learned from my father to appreciate solitary moments. Because of his job, Dad lived alone in a different town for many years. Even when he came home, he spent a lot of time sitting alone. At first, I felt sorry for him. But seeing how content he was – sitting there drinking his tea – I began to understand being alone wasn’t a bad thing. And I began enjoying it. I also learned from my dad that we shouldn’t ignore quiet people. They don’t say much, but that doesn’t mean they don’t care, or they don’t want you to care about them. My mom taught me to be brave, not easily being intimidated by others. I am still not as brave as I would like to be and often have to picture her standing by my side supporting me. She also showed me that I should take my responsibility seriously. She had this thing about duty – fulfilling her duty was her life. When I was five year old, my father took a job far away from home. As soon as I could write a handful of words, Mom started asking me to write letters to Dad for her. At first, I only wrote whatever Mom told me to write. After a while, that became quite boring, so I started reporting to him what had happened at home, and later I added some of my stories to entertain him. I found out that writing made me feel better. And I haven’t stop writing ever since. Finally, Here is a list of things I have done in writing. Jin-Ling’s Two Left, a YA novel, was published on Oct. 1, 2009. 2006 May/June issue of Rochester Women Magazine – Oh, Mother! 2005, Dear Mom, I Always Wanted You to Know – My letter to Mom was accepted but at the end, it wasn’t included in the book, but my email to the editor was quoted in the introduction of the book. 1998 July 8-21 1998 Women’s Press – Empty What? April 18, 2009 Rochester Writer’s Festival, gave a talk on Beginning, Middle and End. Sept. 19, 2009, Won first place in Area 84 Toastmasters Humorous Speech Contest on . Others I’ve started two writing groups: one in 2003 (?) and one 2006. Both groups are still doing well. Thank you for stopping by. Sorry for the late reply. I am learning. I am learning. So many blogs to catch up; so many wonderful photos… I am really happy to get to know everyone. What a great group! Thanks. I like yours too! My goodness Helen, looks like you are doing just great with writing experiences..
Good morning, Roberta. I should update this page. Last two years, I have made 10 videos of people’s life stories, and ghost wrote one (wit a writer friend). Everyone should tell his/her story, I think. You’re a Toastmaster?! Me, too! I also won Humorous Speech Contest for my Area and District but did not place in District. What a ride though, right! You must be a better speaker – I only won the area contest, didn’t place at division. I have to speech at our club meeting on Monday. I’ll work on it tomorrow. Ha. Thanks for following my blog. Your writings are impressive and I will from now on follow your blog. Hi Helen, it’s amazing what we learn from our parents! Getting back to your Dad, I think it’s people who don’t say much, that actually listen more. Once I heard someone say, stop talking and see how much you can learn in a minute, just by listening… something not many people do. Anyway, it seems you have certainly learned a lot along the journey of your life, and might I say, successfully so! Wordpress is such a great place to be able to share. Thanks for sharing your story! Yes, I have learned a lot in my life. It took me a while to find myself and be myself. I don’t know why that was so hard. ha. Did I tell you that I want to take photos like you do? I love your photos. Please, please, if you can give me any constructive feedback about my photos, I would be thrilled. We just took a trip to France and there are a lot of Australians in the tour group. It seems like most of them, if not all, were very happy… sunshine type people. Am I right? Having them in the group was really fun. I think I should forget doing Writing 101 and begin exploring your site instead. I believe I could learn more. Hello, Ronovan. Your comment makes me a little nervous 😉 English is not my native language. I have no doubt that you write much better than I do 😉 Thanks for being so kind. It’s interested that we both like writing YA novel. I can’t wait to read more of your blog. Take care. Hi Helen, thank you for stoping by my blog and deciding to follow, it’s always nice to have someone take the time to look around. This is a great introduction! All the best to you and your blog. Have a great day. http://hummingbirddreamsphotography.wordpress.com invited me to be part of a Virtual Blog Tour, which I agreed to and will be posting on Monday, June 30th. It is also my turn to extend an invitation to one or more people who’s work I’d like to introduce my readers/followers to. There are four questions to answer and you can also add your photos to the post.Here is a link to previous VBTs if you want to check it out before giving me an answer. I feel so honored for your invitation, and I am very excited about it. But I will travel to LA on July 2nd and be back on July 8th, so I am not sure I will be able to post anything on July 7th. For many years, I only have contact with one of my college classmates. Recently, I found 4 classmates living in LA area. We are going to have a small reunion that week. We haven’t seen or talked to each other for more than 40 years! I am afraid I won’t be able to remember posting anything during that time. Thanks. At my age, having fun IS the only thing that counts. I don’t even have to think. 😉 You have a wonderful blog. I love those colorful photos you have. I am looking forward to see more. By the way, I have never been to Norway. And it’s on my wish list! Goodness, you have done so much and still going. I’m so glad I hooked up with you. Thanks for the follow for my blog. I do appreciate it. It is there for entertain. Not a serious bone in its body. Hello, Don. Thanks for stopping by. I like your sense of humor. I admit I was a bit slow. It took me a little while to figure out what you know about women 😉 I was entertained! i just learned about something new about the lens last week. You might know it already. It’s helpful to use a lens that has a stabilizer. I thought I had. But the one that is made with metal works better, a little heavier. Good morning, Amy. Thanks for the information. I, too, thought the lens I use has a stabilizer. I think I better check again. I had a discussion with my husband on this issue. He said the lens I am using (most of the time) is a convenient lens. It is reasonable in price and produces good pictures, but if I want higher quality photo, I have to get more expensive one. I am going to do some experiments: use the same lens with and without tripod, use a different lens do the same. Hopefully, I will find some answers to my problem. Nice site. Enjoyed surfing it. Thanks for visiting. Thanks. I don’t know how I have missed this comment. So sorry. I really enjoy reading your E-Magazine. I hope a lot of people will follow the site because it is so good. Hello, Stacy, thanks for stopping by and following my blog. I feel honored. You have a wonderful blog, which I enjoy reading a lot. I also appreciate you and others show us how you post-processing your photo. I have learned a lot from it. Your blog is not only in my reader, but also in my favorite list 😉 Good night! Your parents thought you well and you are a good student “daughter.” Reading the list of your accomplish that is braver than brave. Well done, Helen. Perpetua aka seeker. Thanks, Perpetua. I know there is room for me to improve. Like you, I have thought a lot about life. But it seems to me that I have a lot of questions, and you have a lot of answers. I like reading your blog! Amazing and impressive. I am looking forward to reading more. Writing has helped me in a lot of ways and I am still learning. So, to find blogs like yours inspires me to want to perfect my writing skills or lack there of. I hope you don’t mind me following. Good morning… I feel like to call you sunshine instead of blueinsomniak… Your comment brightens my day! It will be my honor if you follow my blog. And thanks for all of your kind words. The most important thing I’ve learned in my life is to love myself. I am not a selfish person; I am still willing to give more to others; but I love myself even when I make mistakes. Another thing I would like to share with you is that if I write before I go to bed, I usually don’t sleep well. 😉 I still do, but I try to do less. Wow, thank you. That’s so nice of you to say. It’s actually a privilege to follow you. I’m hoping to learn as much as I can from constant reading and it has helped to also release some of what is inside by starting this blog. I find it very difficult to love myself because I don’t know who I am anymore. Hopefully this is a start in trying to find myself so that I can one day love the person I see in the mirror. Again, thank you. I sure hope so. There is so much anger and resentment swimming around in my mind and to actually put it out there is a bit of a release. I just hope I don’t hurt someone else by trying to help myself. Thank you again. Good morning. Thanks for stopping by. I was going to leave a note on your blog, but forgot. Sometime I glance all the posts and “like” the ones that I do, and later, I would go back to comment. You have a wonderful blog. I have been pondering (about everything) all my life 😉 I am looking forward to reading more. NOT MUCH ? – that’s wonderful, Helen !!! Would that I could claim a fraction of all that. Hi, Helen: Thank so much for the Follow. I like what you are doing here and look forward to seeing more of your photography and your writing. Dear Helen, I understand you support Award Free Blog. However, i could not stop myself appreciating your work and hence, have nominated you for the Liebster Award, if you would like to participate. Thanks. I understand that iPhone or any mobile is not a convenient tool to write blogs. A laptop or desktop is always a better choice. I know you are award free but I still think you deserve an award for what you do. I was nominated for the Harmony & Peace Award and, in turn, have nominated you. I so enjoy your blog, Helen. And your photography….!! I am loving it! Of course you may, Helen. My way to thank you so much for such enjoyment of your blog (s)! Thank you for visiting my blog. I see you participate in Cee’s photo challenges. I love the tribute you wrote to your parents. It is wonderful that you have been published, and that you have two successful writing groups. The organizer of my poetry workshop is having a lot of trouble getting it going, even though many people have joined. I look forward to reading your blog. It is very nice to meet you. Hello Wendy, Thanks for stopping by. Since English is not my native language, I find poems are not easy to understand. I do love the ones that I could fully understand though 😉 Wish I could write them like you do. Such a lovely compliment, thank you Helen, I think anyone that can not only speak a 2nd language but write in it gets my vote every time. Hello, James. Thank you so much for visiting my blog. Your blog attracts me on two parts: beautiful photos and wonderful stories. Nothing can beat that 😉 Thanks. Good morning, Muzzy. My thought are with you and your friend. You are kind to be there to support them. Don’t worry about commenting or reading. You got your priority right, as far as I am concern. Thanks for taking time to drop me a note. Take care. I visited your blog and like it a lot. I plan to read more later (have a niece coming for lunch. )Hope we will keep in touch! Have a wonderful day! Thanks for visiting my blog, The Glasgow Gallivanter. I like yours too! 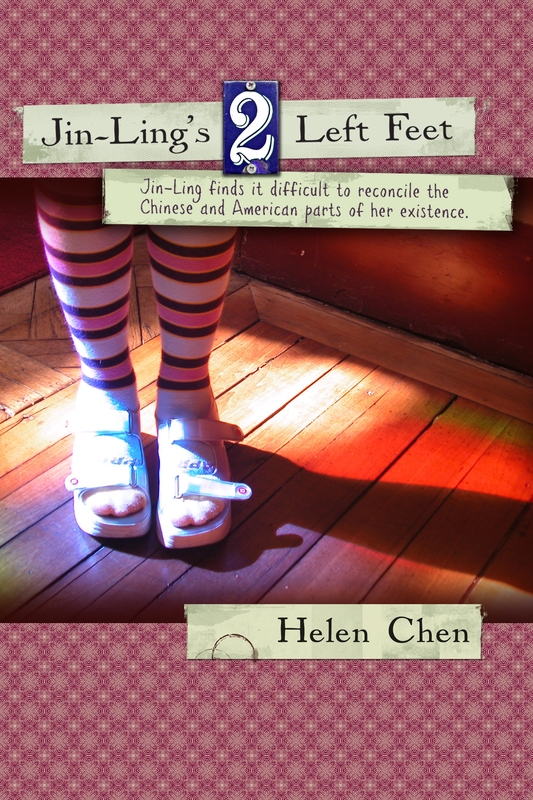 I would love to get your book “Jin-Ling’s 2 Left Feet” for my students. Do you think it is good for students between 11 and 13 years old? Or it is for older teenagers/high school students? Thank you. Thank you so much! You are so kind. I found your book on booksellers websites. I am so excited. It will be good for my students! I will email you later. It says a lot about you and how you were raised by how you spoke about your parents. I’m very pleased to meet you. What a wonderful blog you have! I can’t wait to read more of your stories. Thanks for your family’s service to our country! Your about page is awesome. We are looking forward to following along with your journey and seeing the world through your eyes and words.